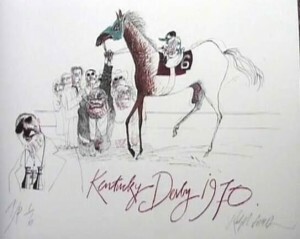 Kentucky Derby Collectibles – Fun and A Great Investment! Central Kentucky Antiques and Collectibles > Buying Antiques & Collectibles > Kentucky Derby Collectibles – Fun and A Great Investment! When you think of the Kentucky Derby, all sorts of pictures may pop into your mind – mint juleps, beautifully dressed ladies wearing elegant hats, souvenir pins and the laid-back charm of the South. The Kentucky Derby is a time of glamor and glitz and also a great time to increase your collection of paraphernalia and collectibles – just for the fun of it – or as an investment. This year, Woodford Reserve bourbon distillery celebrated the occasion of the Kentucky Derby by offering “the world’s most exclusive mint julep cup.” Woodford’s collection of 73 silver cups — exclusively designed by Tiffany & Company – was offered on Derby Day at Churchill Downs, and were also available for purchase online at www.woodfordreservemintjulep.com. The cups sold for $1,000 each and all proceeds benefited The Barnstable Brown Kentucky Diabetes & Obesity Center. You may not want to spend that much on Kentucky Derby collectibles, but there are other bargains to be had. Recently, in an online article on best-selling eBay items, it was reported that vintage Kentucky Derby souvenirs were fetching high price bids, including drinking glasses from the 1930’s and 40’s, selling for as much as $4,000 per glass. 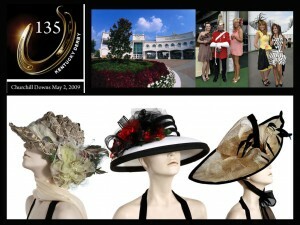 Hats are some of the most popular Kentucky Derby items sold online. They range from vintage hats worn to the big event by society ladies of times gone by to more flamboyant (and sometimes a little weird) hats worn by Derby goers who are trying to out-do each other with their outrageous fashion expressions. Many of these hats are extremely desirable as additions to your memorabilia collection. 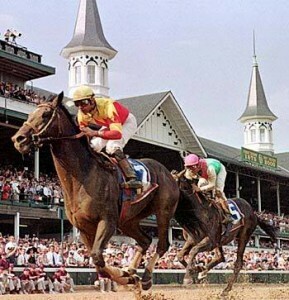 Kentucky Derby tickets can also be highly collectible – especially the winning ones. They can be purchased online in groups, arranged behind glass and framed – or, you can purchase one-of-a-kind tickets and start your own framed collection. Pins of every shape and size are also a great representation of the Kentucky Derby. Festival and Pegasus pins are popular purchases and can be found through online or offline sources in mint condition (still in the box), or in sets displayed behind glass and framed. There are trophy pins as well as jockey and winning horse pins. You can even find a pin depicting the head of Secretariat, one of the most popular horses to ever run in the Kentucky Derby. Items of Kentucky Derby clothing include girls, men’s and women’s shirts and comfortable scrubs that sport the Kentucky Derby logo. You can wear them to show your support for one of the greatest sports events in the world or simply because they’re fun and comfortable. Derby hats, pins, glasses, shirts and canes are just a few of the less expensive offerings that can be found. These items can be whimsical, useful or simply decorative – and you’ll own a bit of history besides. If you didn’t make it to this year’s Kentucky Derby, never fear. Derby collectibles are easily found in many of the antiques shops in and around central Kentucky. And, there’s always next year, so start planning for your collection now! Happy hunting! collected hundreds of items relating to Horse Racing across the US. this collection before my annual trip to Las Vegas in Dec.
heading Kentucky Derby Collection at jolmstead@neo.rr.com. Hope to establish a working relationship.